Beach Vacations is excited to announce the addition of Bali Bay Resort, a property that will continue to inspire the highest standards of modern luxury and clean-cut design. The condos at Bali Bay are sure to leave a last, positive impression on guests who choose Myrtle Beach as their vacation destination. This modern resort offers both ocean view and oceanfront condos that can accommodate groups as large as 16. As if the chic accommodations are not enticing enough, Bali Bay is located at the crossroads of the beautiful Atlantic Ocean and the heart of Myrtle Beach. 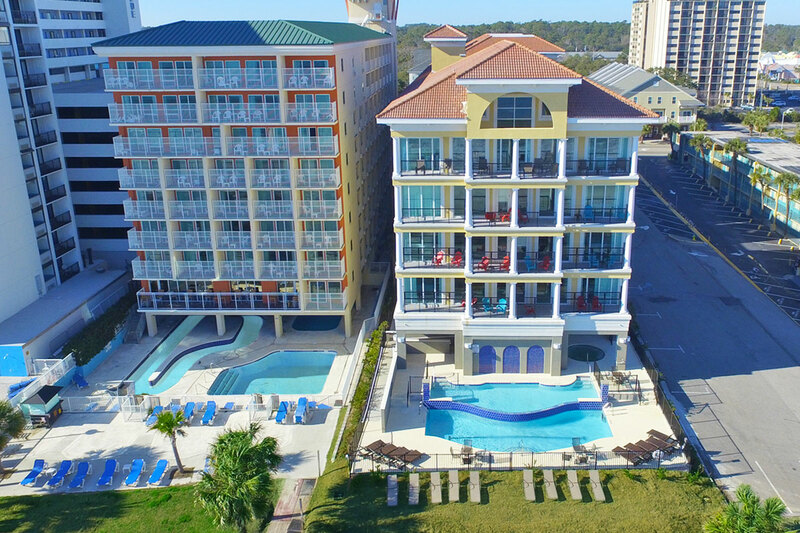 At 701 South Ocean Boulevard, the resort is conveniently located in close proximity to all of the most exciting and frequented attractions along the Grand Strand. For a vacation that combines the relaxation of the beach with the modern, clean-cut style of the city, Bali Bay has everything to make your stay unforgettable. All of the condos at Bali Bay Resort offer guests the best in design and comfort. From the moment you step into one of our condos, prepare to be impressed by the furnishings found inside. Each condo features granite counter tops and tile floors, offering a bright and clean atmosphere throughout. Guests will arrive to a fully-equipped kitchen, with appliances including refrigerator, stove, and dishwasher, as well as other cooking essentials that are kept well-stocked. The modern decor of the living and lounge areas are complemented by flat-screen televisions and sleek, comfortable furniture. All master baths feature garden tubs, which are perfect for a tranquil evening after a long day experiencing the thrill of Myrtle Beach. And with free Wi-Fi, you can remain connected with all of your regular Internet routines. You will certainly live the life of luxury while vacationing at Bali Bay Resort. Outside of the condos, guests will find that the resort is situated in the perfect location. With the beach only steps away from the condos, guests have easy access to the ocean. Bali Bay has an on-site private outdoor pool, as well as jacuzzi, both of which offer guests the perfect options for both fun and relaxation. If you decide to venture out beyond the resort, you won't have to go very far to find dining, shopping, and amusement options for all. Located just across the street, Family Kingdom Amusement Park provides over 35 thrilling rides and attractions, with its waterpark equivalent, Splashes, located adjacent to Bali Bay. Other oceanfront attractions like the Boardwalk and SkyWheel are only one mile away! If you're looking for shopping, Broadway at the Beach and the Market Common are just a short drive away from the resort. And with hundreds of restaurants, from Mom and Pop local establishments to national chains, you will never go hungry! Bali Bay Resort is also a standout choice for golfers, as it is located within five miles of several of the area's top golf courses.